One little-noticed effect of the debt ceiling impasse is that Paul Ryan, that Paul Revere of fiscal calamity, darling of the anti-deficit lobby, has been exposed as a fraud. Technically, I guess he hasn't been exposed if nobody pays attention to it, in the same sense that a person walking naked down a deserted street might as well be at home in the bedroom. But if you care to pay close attention, Ryan's fraudulence is perfectly clear. Ryan has carefully nurtured his deficit hawk image by expressing his Randian ideology in the high-minded language of the establishment. His favorite attacks on President Obama have revolved around failure to lead and a refusal to openly embrace the fiscal commission report (a report Ryan voted against, but never mind). Now, the work of that fiscal commission has passed into the hands of the Gang of Six, which has commanded strong Senate support and might have a chance in the House if its deficit-cutting recommendations were embraced by a figure with the right-wing fiscal credentials of Ryan. Instead Ryan "dropped what one Republican Senate adviser called a 'bomb' on the Gang of Six," snuffing out any chance of success. [W]e’re not talking about cutting taxes. We’re just not agreeing with the President’s tax increases. I guess that’s the new definition of tax cuts. We’re saying keep tax rates where they are right now. And get rid of all those loopholes and deductions, which by the way are mostly enjoyed by wealthy people so you can lower tax rates. We’re basically taking a page out of the play book of the Fiscal Commission, the President’s Fiscal Commission supported by a majority of Democrats said the same thing--broaden the tax base lower the tax rates for economic growth, a simpler, flatter fair tax code more internationally competitive so we can create jobs. That’s what we’re proposing. This isn’t tax cuts. It’s tax reform targeting our revenues at where they are right now. When pressed why he refuses to accept any increase in revenue, Ryan insists he only opposes higher tax rates because they create an economic distortion. The economics profession has been really clear about this – higher marginal tax rates create a drag on economic growth. 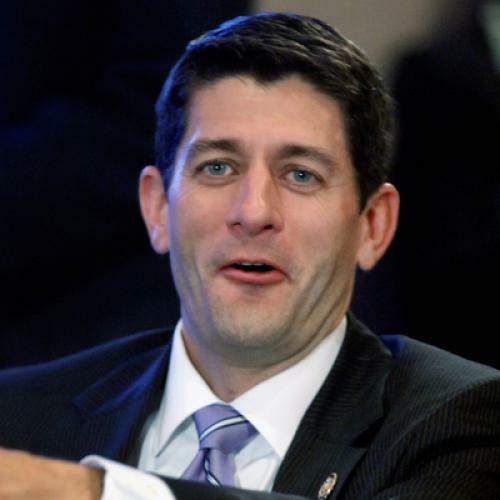 So here comes the Gang of Six with a plan that does everything Ryan proclaims to love. It reduces tax rates. It removes loopholes. It follows the fiscal commission model. Ryan's reaction? The plan claims to increase revenues by $1.2 trillion relative to a “plausible baseline.” It also claims to provide $1.5 trillion in tax relief relative to the CBO March baseline. The CBO baseline assumes the expiration of tax relief, resulting in a $3.5 trillion revenue increase. As a result, the plan appears to include a $2 trillion revenue increase relative to a current policy baseline. In other words: Ryan doesn't really care if nominal tax rates are lower and that all the savings come from closing tax expenditures. He just wants rich people to pay less money to the government, and whether that lower tax bill comes in the form of lower rates or bigger loopholes is the secondary consideration.